Image courtesy of Dasmin Niriella of Photo - N Galleries. Travelling overseas with three young children, I was stressed when it came to making the right decisions with regards to where we stayed and what we did. 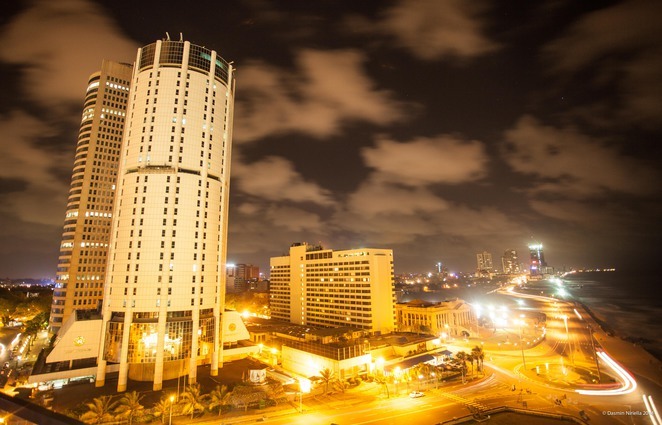 Choosing a hotel for our stay in Colombo, Sri Lanka was not an easy task. After studying reviews on the internet and speaking to those whom I knew I decided to make reservations at the Kingsbury Hotel in Colombo. After a long flight I finally arrived at the hotel in the middle of the night with three sleepy and tired children. From the onset the five star hotel Kingsbury was able to wow us. The facelift has most certainly brought about a grandeur appearance to the hotel from its former days as the Intercontinental Hotel. The doorman clad in white was quite awake and cheerful welcoming us with polite smiles. The staff were very courteous and quick at their work knowing I was eager to put my tried younglings to bed.Checking in done we were escorted to our room without delay. It was only the following morning that we able to absorb the full extent of the beauty of the hotel. The floor length windows opened up to the Galle Face green and the Indian Ocean. What a breath taking view it was to wake up to. The room was quite luxurious with crisp white linen, comfortable beds and high quality toiletries. The food at Kingsbury is to absolutely delicious. Seated with the ocean in view we indulged in the multitude of eats the sumptuous buffet offered. For the more adventurous foodie there are those local favourites such as hoppers, string hoppers , milk rice and roti. All to be eaten with the added flavours from a wide selection of sambals and curries. Those who shy from spices do not have to worry as there is plenty to choose from the western buffet. We were pretty happy that our stay was lengthy as we could not have been able to savour most on offer in one or even two sittings. The coffee shop, which is opened till evening, is well stocked with sweets and savouries if you wish to indulge yourself in a mid day snack but most of the time we just had a beverage or two as the main meals were enough to fill us up quite satisfactorily. Since we opted to relax most of the days in the hotel itself rather than venturing out we were able to get the maximum of our Kingsbury experience. 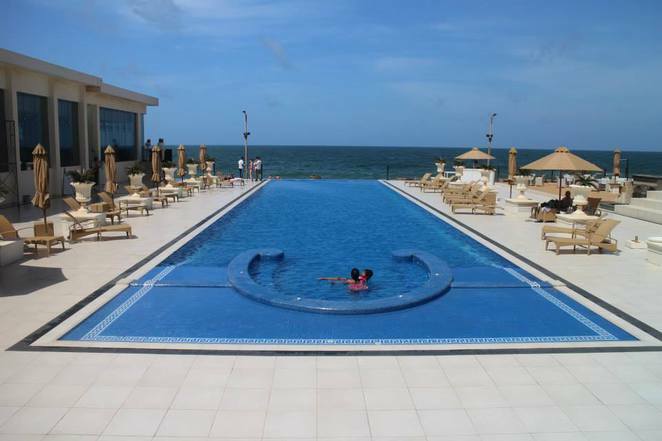 We spent quite a few hours soaking in the vast blue swimming pool overlooking the ocean. Here at the poolside, I was able to read from cover to cover not one but two books as the entire setting was so relaxing and quite except for the cheery laughs of my own brood playing in the water. The gym and the saloon too were to my satisfaction with knowledgeable staff manning both. The sky lounge on the tenth floor is a must visit. With breathtaking views of the city below and the sea breeze circling in the air the adult space was capable of giving me a relaxing time catching up with friends and family. All in all our stay at the Kingsbury revitalized and rejuvenated us all and gave us a good start to our stay in Sri Lanka. 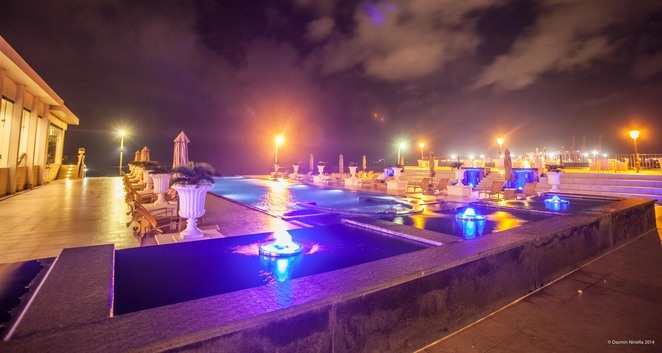 The hotel which is centrally located is one which offers quality and luxury and I wouldn't hesitate to recommend the Kingsbury to any one touring Sri Lanka.